Located on the popular shores of Hilton Head Island, Marriott's SurfWatch is a masterpiece of seaside style along South Carolina's East Coast. Our spacious 2- and 3-bedroom villa rentals feature separate living and dining areas, a fully equipped kitchen, master bedroom and bath with a deluxe multi head shower, washer and dryer, and balcony. Capturing the essence of the surrounding nature, scenic footbridges lead you throughout our vacation ownership resort, to a spectacular oceanfront pool and the beach along the Atlantic. 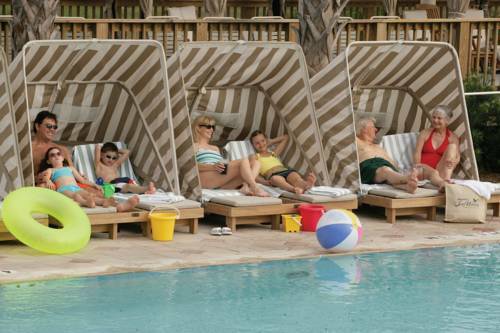 There are two other heated saltwater pools as well as a seasonal oceanfront pool bar and our Marketplace Express for snacks, cold drinks, and more. Stay active at our fitness center, plus enjoy shuffleboard, gas grills, a fire pit with picnic tables, and a kids activity center. These amazing amenities are at your fingertips here at Marriott's SurfWatch. Plan your Hilton Head Island escape today. The Marketplace Express: The quick stop for an assortment of essential snacks and sundry items. Featuring Starbucks coffee.